What do you want to know? Go ahead ask me anything. There are times that I draw a blank and can’t think of just the right word to describe something I am writing about. You know that feeling when it’s right on the tip of your tongue or should I say fingertips, and you just can’t think of the perfect word. Then there is that word that I think would be cool to use but I want to verify that I am spelling it correctly and using it properly. For instance take the word bestest. Okay, now I know that bestest is not really a word. The reason I know that is because spell checker keeps changing it to “beset”. But I have seen it used and it sounds kind of cool to me. That’s when I call on my bestest bud and ask what the definition is. I type “bestest” in the search field and get “about 4,650,000 results (0.15 seconds)”. The super-superlative form of the word good. A word that is better than best. Exemplifies that someone/something means a lot to you and are better than the best. They are the BESTEST. Chase is my bestest friend. My bestie is very smart. She can be visually descriptive by showing me hundreds of images. What is that pain I have in my right side? How do I describe a rainy day? What movies are playing at my local theater? Should I take my umbrella? What would I look like with blond hair? How do I get to the hairdresser? I’m not sure how I got along with her before, but I sure wouldn’t want to do without her. 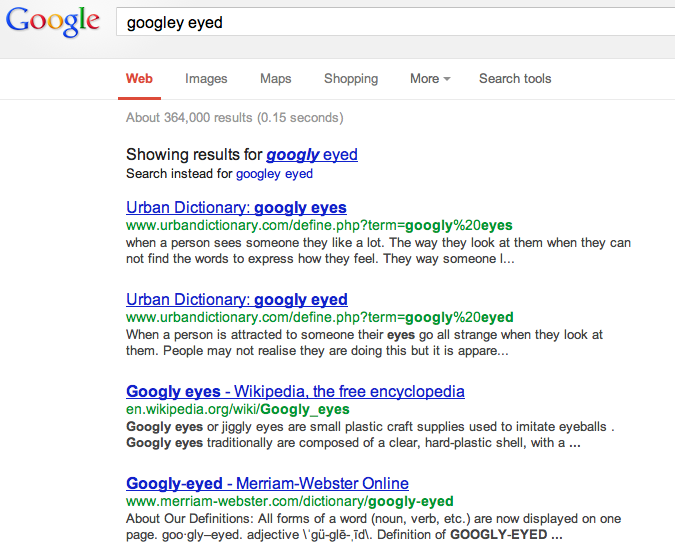 I am googlyeyed for Google. Thank you for stopping by. I've been having fun with the challenge and have been visiting great new (to me) blogs. I know what you mean. I've had a few senior moments myself. Damn! I thought your bestie was going to be Ross! Well, Ross is my bestie and he does provide me with plenty of bloggy material. Thankfully he is a good sport about it too. I am pretty knowledgable about the rules of the English language. But there is always that one rule of thumb that takes precedence on my blog: "If it feels right and sounds good, go for it. After all, it's my blog..." It's the bestest rule in town. That's the I feel too. I try to make sure that what I write is understandable, but I have to like it first and best!